This recipe also appears this week on Dallas Decoder, representing the Barnes family in the Barnes-Ewing holiday bake-off. 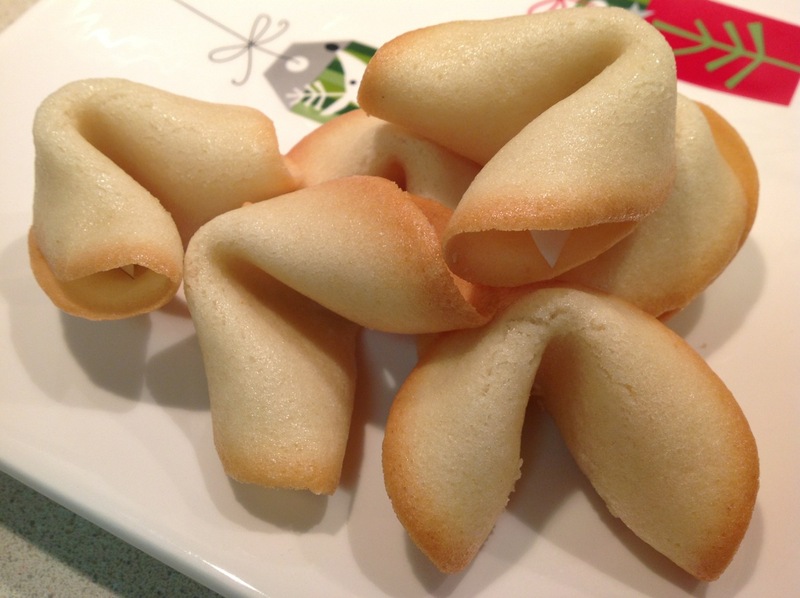 Fortune cookies seem like a simple dish, but they’re easy to get wrong. I remember trying to make them as a kid and having them turn out just horribly. My mom recalls a similar experience of her own. 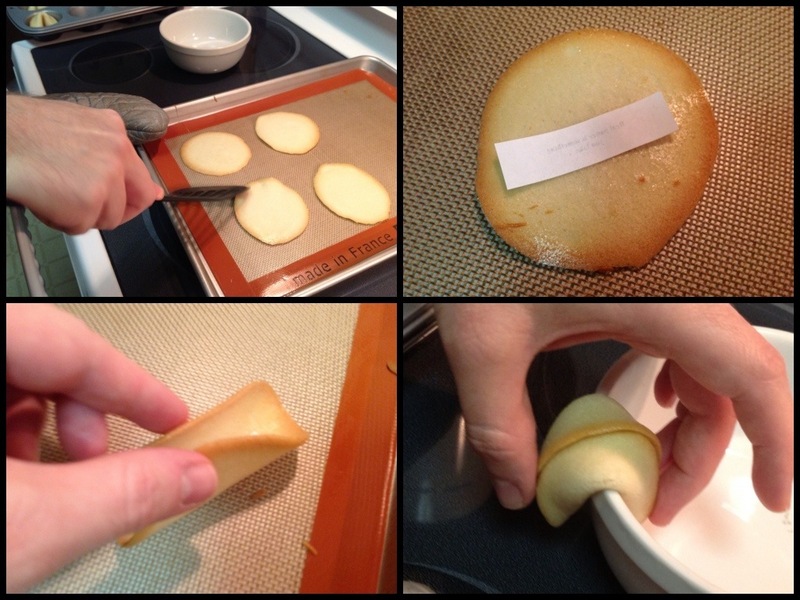 Print your fortunes ahead of time and cut them small enough to fit in the cookies: 2 1/2 x 1/2 inches. The batter has to be just right—thin enough to spread easily and airy enough to provide the right texture. It’s easy to end up with cakey fortune cookies, which won’t seem right. But the hardest part is folding them. Not because the folds are particularly complicated but because 1) the cookies have to be folded quickly; if they cool too much they will break rather than fold and 2) achieving good results means folding them while they are hot out of the oven and…ouch! After folding the about 16 cookies this recipe made, my fingers were glad to be done. Supposedly cotton gloves will help, but certainly oven mitts are out, given the nimbleness required to do this. To get the fold right, I really appreciated the advice from Yoyomax12, who has a useful demonstration video on YouTube showing how to first fold the cookie in half with the fortune inside and then to use the lip of a mug or bowl to fold that halved cookie into the familiar rounded fortune cookie shape. These steps must be done quickly while the cookies are still hot out of the oven, so plan accordingly and don't try to fold too many cookies per batch. I recommend starting with one the first time. I recommend that you bake and fold just one cookie the first time you do this. As you get the the hang of it, you can do more, but I wouldn’t recommend trying to bake and fold more than about 4 or 5 per baking cycle. 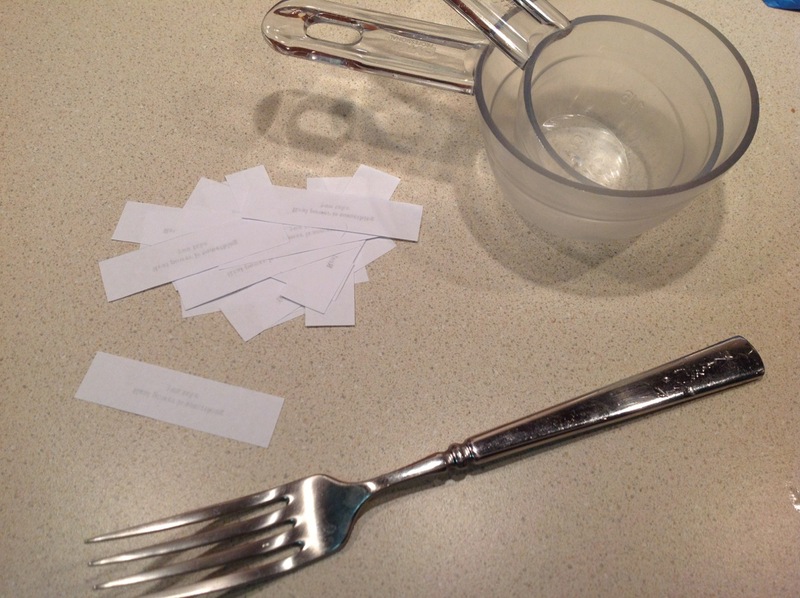 Be sure to have the fortunes ready and printed ahead of time and cut into 2 1/2 by 1/2 inch strips. Writing your own fortunes is its own creative exercise. Dallas fans will recognize this fortune as advice from father to son. 2. Add egg whites, vanilla and almond extracts and oil to a large bowl. Beat on medium-high speed with hand mixer until frothy, but not stiff, about 1-2 minutes. 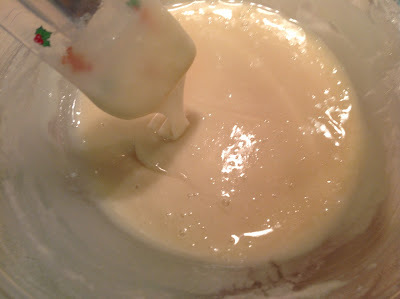 Add the flour, cornstarch, salt, sugar and water and blend with a spoon until smooth. 3. 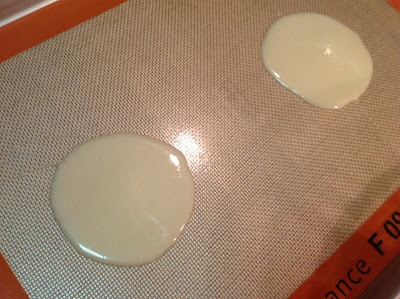 Line a baking sheet with parchment and grease lightly with butter or oil. Drop a full tablespoon of batter on the baking sheet and spread evenly with the spoon into a circle about 3 to 4 inches across. Repeat a few times, but not too many, since you’ll need to work quickly to fold the cookies while they are hot after they come out of the oven (I recommend just making one the first time, and then increasing the number of cookies per baking cycle as you get the hand of folding them). Bake for 12-14 minutes until the cookies are lightly browned around the edges (they will still be light in the center). 4. Remove from oven and, working quickly, fold the cookies into the fortune cookie shape by: 1) use a spatula to turn cookie over, 2) place a fortune (writing down) in the middle of the cookie, 3) fold the cookie in half over the fortune, 4) take the folded cookie and use the lip of a bowl or mug to bend it into the familiar half-round shape. 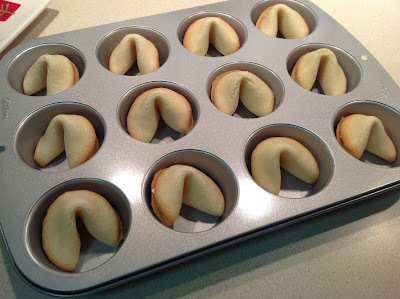 Place folded cookies in a muffin tin to cool (the muffin tin helps them keep their shape as they cool and harden). Refer to the pictures above and the video link to see exactly how this works. Repeat as needed to use up the batter. These turned out amazingly well! Nice job. 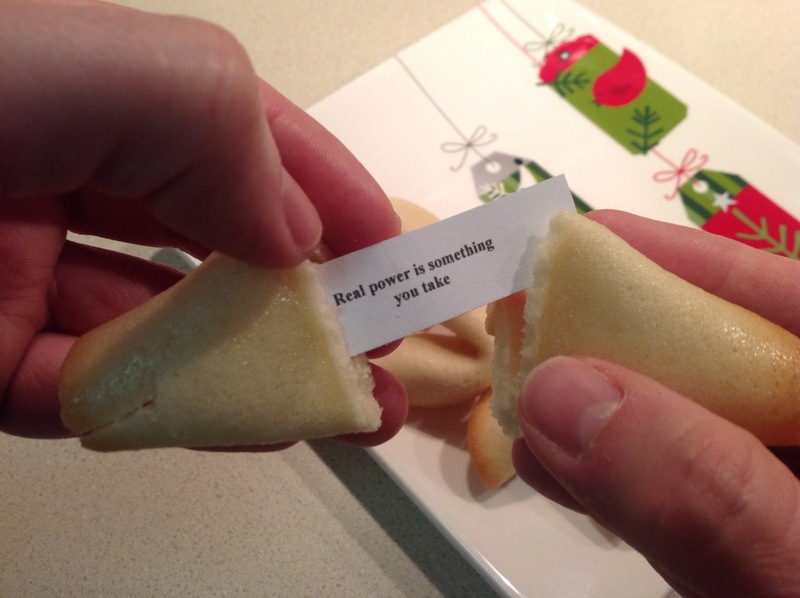 Except now the fortune cookies we get from our favorite takeout place pale in comparison to yours.
" I never thought I'd be glad to see you." " I've been beaten before, but I have never lost. Understand the difference? "Sharpen up your ice skates, it's gonna be a long winter." "Game's over. Checkmate. You lose, I win. BINGO!" "You live with vipers, you become a viper!" "You shut your mouth or you're gonna lose your face!" I will take your advice before making a full batch and practice folding the cookies until I get it right. Ha! I suppose they don't watch Dallas? I like the idea of someone's stunned expression upon getting this fortune: "Game's over. Checkmate. You lose, I win. BINGO!"